So You Want To Be The Logi Anchor? While some of the staff writers here at Crossing Zebras obsess over fittings for various ships to create maximum enemy explosions, I spend most of my time in-game attempting to prevent my group’s ships from being exploded. Yes, I’m a logi pilot. Welcome on almost any fleet, logi pilots are always in demand. However, in large fleet battles, there is role desired more than a logi pilot, and that is the Logi Anchor. The logi anchor is responsible for leading the logi pilots during an operation and trying to maximize their effectiveness. Some groups refer to the logi anchor as the Logi Captain. The basics of logi piloting are straightforward. Identify ships being damaged by broadcasts or the watchlist and rep them. The role of the logi anchor, on the other hand, gets quite complex and sometimes pretty stressful within certain fleet doctrines. The primary goal of the logi anchor is to keep the logi ships out of harm’s way, mainly by using piloting to move the logi ships out of range of enemy DPS and EWAR. This requires having a good grasp of the spatial relationships in the fight, and the ability to manually pilot. Typically, the other logi ships will orbit the anchor at a short distance, say 1–2.5 km, and not have to think about piloting at all. They can completely focus on the task of locking and repping friendly ships during the fight. These pilots are putting their trust in the anchor to keep them out of harm’s way. Your main job is to pilot, not rep—Maintaining position is paramount. If you get distracted by broadcasts while your fleet starts to move, or worse, the enemy moves to bubble and tackle you, you have failed. You must maintain good situational awareness at all times during a fight. Rely on other logi pilots, typically the secondary anchor, to call out when it’s time to overheat reps or switch to a vulnerable ship. You cannot do everything at all times, so make sure other logi pilots are stepping up to help with the fleet operation. You want to position the logi group in such a way as to situate the enemy fleet on the opposite side of the DPS fleet to maximize your range from the enemy, while staying within rep range of your fleet. 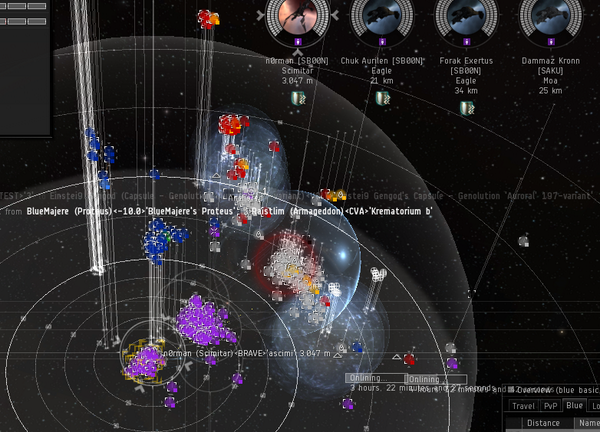 If it’s a slugfest without a lot of fleet movement, staying about 50 km off would be optimal. Don’t try to work the edge of your range at 60 km (even though your reppers can reach that far); you will be at a disadvantage for movement by the FC, and may find some fleet members out of range. If the fight has a lot of movement, you’ll want to move in closer, about 30–40km so you can be sure of staying with the FC. They aren’t thinking about you and will likely move without saying anything—have the FC locked and always watch their range; they will be the center of the DPS blob. I usually leave a single repper running on the FC just in case. If it ever turns off, I’ve gotten out of range. Prep the logi wing —There are several things to be done before a fleet leaves. The FC, secondaries, wing commanders, ‘Dictors, and other special snowflakes need to be watchlisted. I usually recommend pilots watchlist one above and one below them in the logi chat channel. Identify a secondary logi anchor, in case you get blapped or waggroed or some other horrible fate. Make sure lower skill pilots have some Mindflood and 3% logi implants if they are needed for capacitor life. Ask if there are new logi pilots, and try to answer any questions before the fleet starts rolling out. Always remind them to check their broadcast settings and make sure they have targets turned off. Maintain the logi comms—Many groups separate logi comms from the main fleet for several reasons. First and foremost is that logi need to communicate clearly about things that the DPS and EWAR groups don’t need to hear. DPS pilots are basically neanderthals during fleet ops, their comms filled with blather, inanity, and keyed up burps and farts. Logi comms are a more refined place, with discussion of more intellectual topics while we sip tea and reflect on our general superiority. However, on occasion you might need to tell the logi pilots to quit their debate of Plato versus Aristotle and STFU because the fight is starting. On longer ops and bashes, there is often little for the logi pilots to do, so try to keep people entertained with conversation and other light stuff. Always be ready to tell them to “get back on the clock” if something is happening, but in general, cut them some slack during down times. The slight differences in what you say can make a difference. When the enemy DPS is not enough to alpha, but is enough to kill over time, your FC may decide to switch target calling to try to remove enough enemy DPS to allow you to hold reps. If you are getting alphaed, the fleet may have to disengage or get out of range. 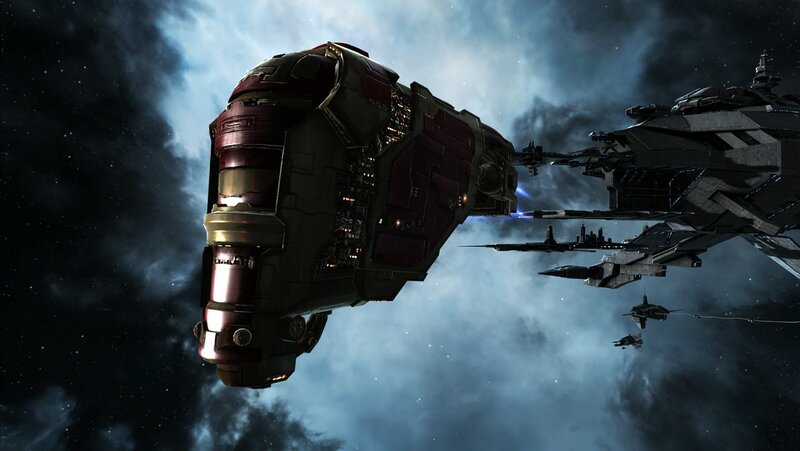 Often, the enemy FC will attempt to tackle, bubble or EWAR the logi ships. The anchor will call out to the FC what the danger is so action can be taken. Short phrases like “FC, get this Sabre that’s almost on top of the logi.” or “FC, kill that damn Blackbird or our reps won’t hold.” make your needs clear. Communicate with the fleet—Even though it’s been said on fights many, many times before, you need to remind the entire fleet to be sure their hardeners are on and that they must broadcast for reps or they will die. People will forget and new pilots learn by hearing it repeatedly. Sometimes, you will have to tell pilots to stop broadcasting for reps. Typically, a new frigate pilot will broadcast when on a fleet with HACs or other higher end ships. They need to stop; the time spent locking them is time wasted, not locking a mainline DPS ships that might be getting primaried. Some pilots get excited when they get targeted and start broadcasting repeatedly for reps. This can screw up the broadcast window as it fills with the repeated messages. You must smackdown the pilots that do this without mercy. You cannot allow this lack of mental fortitude to spread to the rest of the fleet, lest they be infected with this dumbness and the fleet spirals out of control. When the fleet gets bombed, you need to remind them not to broadcast for reps. That moment is frantic for logi. They are repping the FCs, the wing commanders, and the rest of their watchlist first, while looking to see if anyone is broadcasting as primary. Typically, once that’s done, logi pilots will start locking and repping ships a bit randomly to spread out the work. At some point, you may call for the fleet to broadcast for bomb damage. Be careful with this, as it can be a mess. Sometimes you can call for “If your name starts with A-F and you have bomb damage, broadcast now” or “Any logi pilot with bomb damage, please broadcast now.” Try to keep it under control and find a good time for this. With the enemy still on grid, it can be dangerous, as their primary target’s broadcasts could get lost in the bomb damage broadcasts. Stay calm and keep focused—Even though you are the logi anchor, you will often not know how the fight is actually going. Yes, you can hear the primaries being called, but likely aren’t looking to see if there are explosions, or whether we are switching targets to try to beat the enemy logi. You need to trust the FC to do their job, just as you want them to trust you to keep the fleet alive. If you are calm, the rest of the logi will stay calm and do their jobs. Be positive and thank the other logi pilots—Win or lose, exciting or boring, complete victory or awful whelp, be sure to thank all the logi pilots. 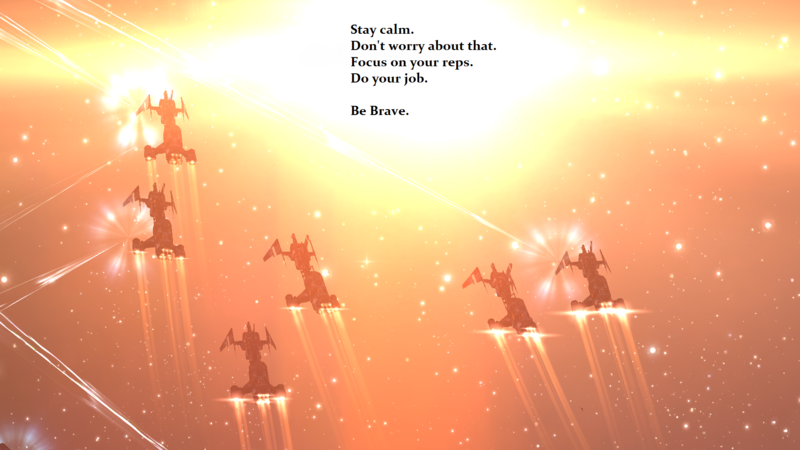 Flying logi is a task not everyone is suited for, and those that do need to hear they are appreciated. Focus on the positive aspects of the battle, even if mistakes were made. If you want to have a logi wing for the next fleet, how you treat people as the current fleet winds down matters a lot. Every group is going to run things a little differently, and these are the basics that apply to most. The job is stressful but rewarding, as you know you are making a real difference and not simply pushing F1 like a monkey. Talk to current logi captains, and listen to their suggestions. You can probably get the feel of it on a fleet with one of them as a secondary to help backseat drive you if things start to go a bit sideways. There is plenty to learn that can’t be taught in an article like this, so reach out to others that have the experience. Good luck, watch your range and cap, don’t overheat too often, and have fun.